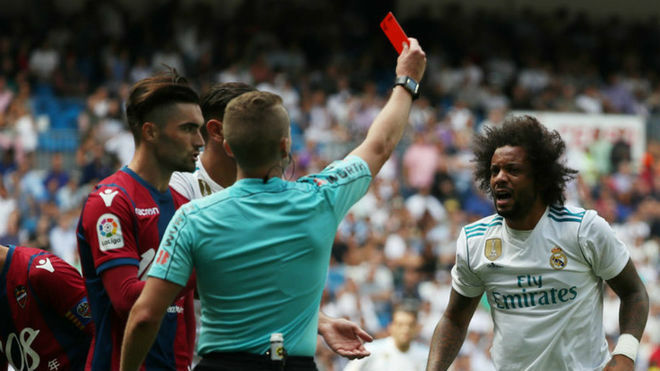 After the final whistle blew at Bernabeu there was considerable whistling aimed at the referee Hernandez Hernandez most notably for his decision to send off Marcelo and it was as if the match official had been decisive in the result but in reality the fans would be better looking at the disjointed performance of the team. Zinedine Zidane decided to rotate his squad by playing Marcelo at left midfield, Marcos Llorente in the middle (he struggled to cope) and with Bale as centre-forward following the early injury to Benzema. If the policy of resting players worked last season it is too early to criticise but it is true that an analysis can be made and the team lacked some of the regulars especially with Ronaldo suspended. The Frenchman would not have expected the lack of concentration at the start of the match and then the generally relaxed approach that allowed Levante to grow and it appeared to be contagious. Benito Floro once spoke of the importance of throw-ins but that seemed to be unknown to the present players with Ivi Lopez able to have a couple of touches in the area without a challenge following a throw-in from Ivan Lopez. Following the goal it was always going to be an uphill task and every decision by the referee was scrutinised although none were decisive in the outcome. It is true that some calls were possibly wrong but the errors from the players were far more notable and there was no drive and desire on the pitch from the players. “It is very important to start well the games,” said Zidane, which his side failed to do and they paid the penalty.